I’m gonna give myself some slack for December 2014, though, as I completed not one, not two, but THREE Christmas gifts for others (and am half-way through another project, to boot) .. so last month was spent actually MAKING things to blog about, at least. I’d long coveted Cynthia Rowley’s (bizarrely out-of-print) Simplicity 2192 pattern and, after months of trying to work out how to best sew it for my own selfish needs (HA), I chose it as my mum’s Christmas present. Knowing her wardrobe involves lots of navies, purples and burgundies, I thought I’d make something that’d co-ordinate with her existing wardrobe AND could be dressed up with a skirt or dressed down with jeans. I am a very thoughtful daughter like that. 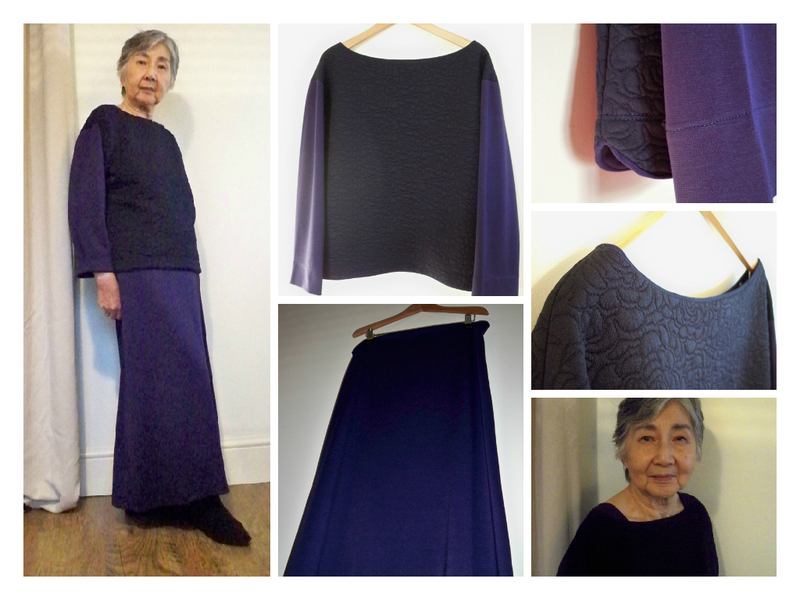 So this mid-weight quilted cloqué jersey in midnight blue looked perfect (hurray for Ebay). 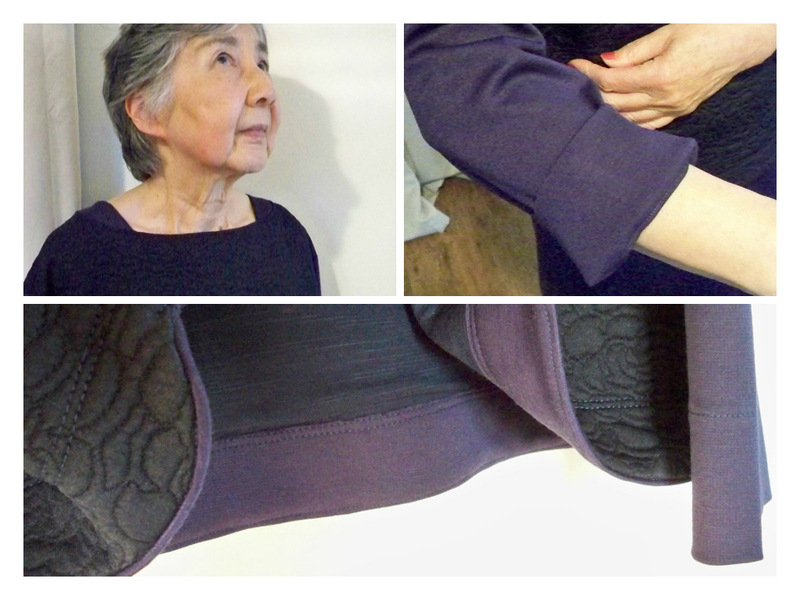 I worried it would be too stiff for the whole garment, however, so plumped for this dark purple ponte jersey for the sleeves and facings instead. Navy and purple? WIN. Realised that the sizing didn’t go up to my mum’s measurements. So made the closest size I could, and figured the nearly 10″ of ease would get around any fit issues (it did, and then some *boggles*). Shortened the pattern by a couple of centimetres, as my mum’s diminutive (aw, bless). Noticed that the inside of the cloqué felt yucky. Grimaced. Dug out viscose jersey from stash to line the body. Threw aside neck facing, sewed neck edge with a deeper (20mm, rather than standard 15mm) seam. Lined the body, but when turning it out realised I’d created a faux piping at the neck edge. Grunted. Decided to call it a ‘design feature’. Tried to replicate the effect at the hem edge, totally distorting the drape as the interior lining jersey wasn’t long enough for the exterior jersey. Grunted and swore. Cut failed attempt off. Felt very glad mother is, as previously mentioned, diminutive. Hemmed top again, as per pattern instructions (without hemming edge of facing as fabric didn’t fray), vaguely rolling out contrast purple hem facing to create another faux piped look. Did two rows of top stitching (trimming any excess seam allowance at the edge of the facing) and stitched in the ditch, to hold everybody in place. Decided to call it all a ‘design feature’. Again. Did deep hems on the sleeves, so they can be turned back and show of dinky wrists. Squinted at finished item. Couldn’t tell front from back. Grunted. Again. Hand sewed strip of bright pink ribbon on back neck edge as a label. Pressed top. Wrapped in Christmas paper. Ensured Santa delivered it on time. It was almost a success. Almost. Mum has such narrow shoulders that it kept slipping off, and the off-the-shoulder look .. yeah, not her thing, weirdly. She liked the fabric, but her first response was, ‘is it a coat?’ as the dense cloqué PLUS the thin jersey made it kinda .. coat-y. Or at least jacket-y. As I had plenty of the purple ponte left over, I decided to quickly knock-up a matching skirt for her, too. Which I threw together yesterday afternoon, using the maxi skirt tutorial I stumbled upon previously. Which means *sudden realisation face* I actually sewed FOUR garments in December 2014!! A New Year, a new outfit for my mum and, given the skirt I made needs no elastic to keep it up, the perfect outfit for a New Year’s Day blow-out roast lunch *gives Domestic Goddess badge a huff and a polish*. Here’s to 2015 being just as productive! Beautiful! I like your choice of material.